One of the things that PC users have to make sure when they shop for new hardware for their devices is that the new hardware components are compatible with the device. You may use the widget to select a brand and model, e.g. a motherboard brand and model, or a PC manufacturer and model name of the PC, to determine whether the component is compatible with it. Amazon may suggest that it is compatible, that it is not, or may tell you that it has no information on compatibility. You may click on a link to display a list of compatible components that match your query. If you look at RAM, Amazon will display compatible modules for the selected device or part. Partfinder works only for devices that have model numbers; you may select a prebuilt PC or laptop, or a component such as a motherboard. 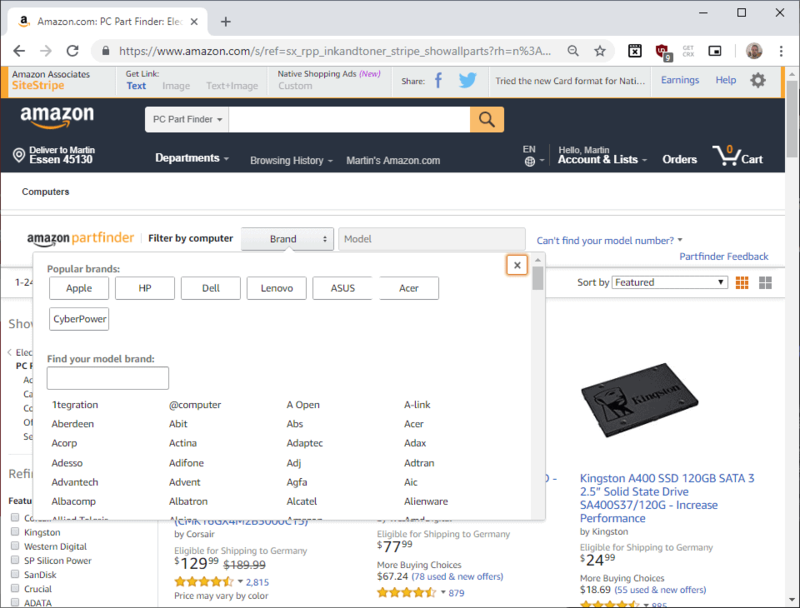 The list is limited to what is available on Amazon and it is quite likely that you may run into issues finding certain models or components. You cannot use the tool at this point in time to create a list of compatible parts if you plan to build a PC on your own. You could pick a main component, e.g. the motherboard, and check other components to ensure that they are compatible. PC users who want to build their own rig might want to stick with PC Part Picker for now or other services, e.g. Alternate's option to build a compatible system in Germany. It is still recommended to double-check the suggestions to make sure that Amazon's assessment is correct. I don't know how popular Amazon is when it comes to buying all parts to build a PC rig from scratch. I never met anyone who did that; all prefered PC-specific vendors, e.g. Newegg, instead. Amazon seems popular when it comes to certain PC parts, e.g. a new Solid State Drive or a computer monitor though. Very good to know yet another way to check compatibility; needed info many years ago by manual search was a lot of work with uncertain results. 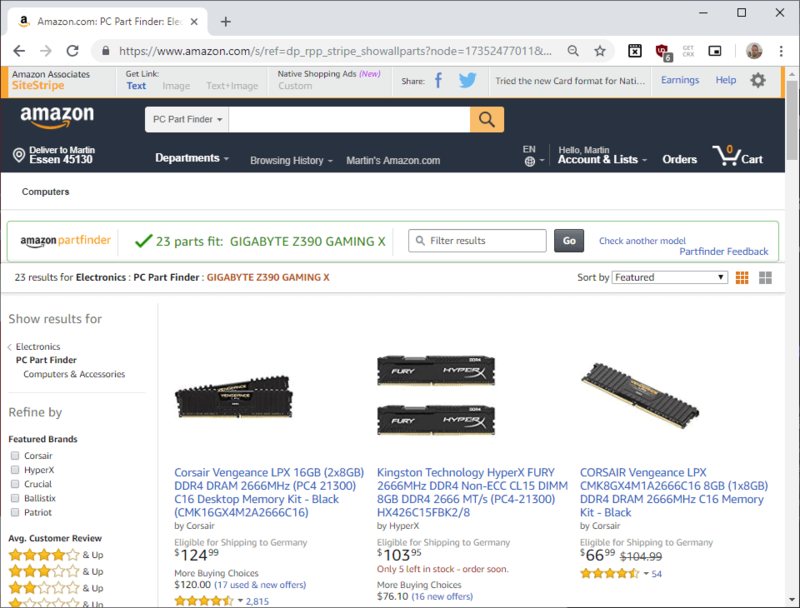 I’ve used this site for compatibility checks https://pcpartpicker.com/list/ , Amazon even copied the name. Oh, good.Another way for Amazon to learn about you/your system. @Borgy: Presumably, this is intended for people who shop on Amazon anyway — so that information has already been gleaned. Thanks for the news, it’s something I’d use to check, just as I check prices on Amazon even if i don’t buy everything there. Needs work. I bought a 860 EVO SSD for a Thinkpad X220. Amazon’s new tool replied the part was undetermined to work. My primary concern was 7mm thickness which the specs qualified. SSD fits and words fine. I don’t use Amazon services, I don’t like the company, its concept, its policy, its boss. I don’t like this damn system which is breaking small businesses one after another. Here in France at one time we had many bookstores here where I live and elsewhere, then the big FNAC came in and gathered books among other things, and bookstores disappeared. Now Amazon takes on FNAC and others, many others, many more others. All these companies because of their monopolistic structures and ambitions are progressively destroying diversity. And people follow, which is what saddens me the most. I don’t use Amazon services, I don’t like the company, its concept, its policy, its boss. I don’t like this damn system which is breaking small businesses one after another. This might be a good way to understand whats needed & whats a mistake. I’ll probably give it a look see..
@Supergirl: Why not use one of the several already existing services that do this instead of Amazon’s? I think a couple have been mentioned in the comments here.